Then there was the shame of the writer who doesn’t write. The me who carried within my breast in equal shares the conviction that I could write and the certainty that I could not. Longtime fans of The New Yorker magazine are the perfect audience for this memoir. Ms. Groth writes of her 20+ years as a receptionist on the 18th floor of the building where the magazine offices were located. The floor housed 40 writers and six or more cartoonists. The reception desk can be likened to a ringside seat at a much-loved and revered weekly publication. The opening chapters serve as a low-key introduction to Ms. Groth, a newly-minted graduate of the University of Minnesota with aspirations of becoming a writer. The move to New York City was like going to a foreign land after living in the Mid-West. These slowly-evolving vignettes are strung together to illustrate her rather humble beginnings at the magazine. 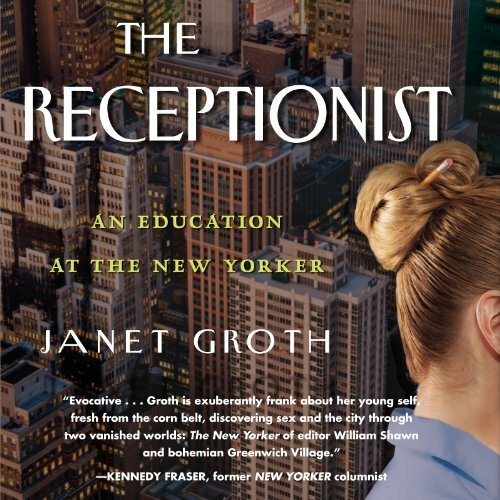 The vignettes offer the reader glimpses into a world of art and literature based in Manhattan where the game of six degrees of separation can be traced back to Ms. Groth’s earliest years – beginning in 1957, right up to her “graduation” to the world of college teaching in 1978 after earning a PhD in literature from NYU. Her grammar is impeccable and the evenly-paced narrative becomes remarkably open with many elements of her life that are both risque and expected for life in Manhattan during the sexual revolution. It is as if the reader is delving into all aspects of Ms. Groth’s life after getting to know her. A young woman whose job is receptionist in a rarefied circumstance sees and hears rather remarkable things. She can become indispensable to the staff and literally become part of their lives outside of work. This is especially true when she is a constant presence in an otherwise changing array of personnel. Clearly, some of the long-time and revered writers and editors form the nucleus of the staff and their interactions with Ms. Groth are fascinating. Today it would be unusual for an employee to maintain a receptionist position for such a long time in one department or company or area of an organization. To her credit, Ms Groth provides the reader with an even-handed account of her ownership of what transpired over her two decades at The New Yorker. It is a sui generis true story. 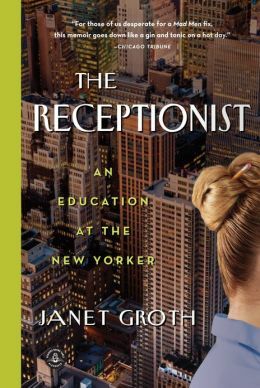 A review of The Receptionist: An Education at the New Yorker by Janet Groth. Like the news anchor in Don Henley’s song “Dirty Laundry”, Mike Wallace could have been an actor but instead he wound up as the attack dog on CBS-TVs vaunted and often over-praised show 60 Minutes. As clarified by biographer Peter Rader, Wallace was in fact an actor, a performer and not an actual investigative reporter. That’s because he did not do his own research, his own homework – he relied on others to do the dirty work and write his material for him (including two supposed autobiographies)… And yet, Wallace was very good at what he did. As detailed in this frank account, Wallace may not have felt sorry for himself but he constantly dealt with depression. Wallace was to make multiple suicide attempts, he divorced three wives before marrying a fourth, and he was generally – even close to the very end of his life – estranged from his children. On the small screen, Mike Wallace was a tiger – but in his own life, in his own skin, he was often afraid of the shadows of the night. This is one of those biographies which does not ask you to change or revise your opinion on the subject. If you were not a fan of Wallace (and this reader/viewer was not), this book will not make you an admirer. If you were a fan of Wallace, this book will not require you to dislike the man that he was. Like a great political compromise, it provides enough for those on both sides of the argument to feel both vindicated and not quite pleased. In Mike Wallace: A Life, Rader has met his self-stated goal of producing a comprehensive bio of a public figure which “sheds light on our understanding of both the world in which we live and also on what it means to be human.” It seems that for the legendary, on-stage performer Mike Wallace, living the day-to-day existence of a normal human being – away from the stage lights, without makeup – was the toughest of all his assignments. A review copy was provided by the publisher. Mike Wallace: A Life is also available as a Nook Book and Kindle Edition e-book. This is the continuation of our interview with Nora McFarland, author of A Bad Day’s Work: A Lilly Hawkins Mystery. 6. Ruta Arellano (RA): The ending of Going to the Bad left Lilly in a state of closure with regard to family secrets. Will there be future books featuring Lilly Hawkins, Rod and her newly-discovered cousin Jack? There’s at least one more book I want very much to write. Lilly needed to come to terms with some of her family baggage in order to move forward in her personal life. Now that she’s done that, there’s a very important day in her future that I’d love to center a book around. I won’t get into specifics, but that day is set up at the end of Going to the Bad. 7. RA: There are notable class distinctions among the various families whose lives and pasts intersect for Lilly in Going to the Bad. Are they indicative of your take on Bakersfield? Does the somewhat isolated location of Bakersfield foster those distinctions? I believe those kinds of class distinctions exist everywhere in our society, but it’s true that things have gotten much worse in Bakersfield over the last five years. California’s Central Valley has been especially hard hit by the recession and housing crisis. Double digit unemployment is the norm there and in some cities it reaches as high as thirty percent. The real estate market was insanely inflated so the correction has been very painful. Almost everyone I know there has suffered in some way. Several of my friends lost their homes and jobs. 8. RA: The dedication of the KJAY news team to cover events as they unfold is pronounced in Going to the Bad. Is this because one of their own is at the center of the story? It’s always difficult when someone who works in news becomes a part of the story. I like to believe that the KJAY news team would be just as dedicated, regardless of Lilly’s connection. Where the real difference lies is in the rules Lilly breaks in her pursuit of the truth. She trespasses, steals, and lies in order to discover who shot her uncle. No decent journalist would ever do anything like that. It would be unethical and could even give those that the journalist is trying to expose a weapon to discredit the investigation. 9. RA: Lilly has size 10 feet. Why have you provided her with them? Is this a metaphor for her earthy, grounded attitude? I originally intended it as a quirky character trait, but in later drafts of the first book I began to think of it as a metaphor for Lilly’s awkward social skills. At one point Uncle Bud looks down at her big feet and says that the family always hoped she’d grow into them, but it doesn’t look like she did. In later books, as Lilly matured, I started to see her big feet as an asset. She can kick in doors and be tougher because she’s got these giant boots. It you want to take the metaphor a step further you could say that she’s taken what was once a weakness and made herself stronger. 10. RA: On a personal note – Did you encounter Chris Curle at CNN, who has a personality that’s bigger than life? I didn’t, but my husband Jeff Ofgang did. He worked with Chris and her husband Don Farmer back when CNN was in its old building on Techwood Avenue. Joy Harkness had built a career and a safe life in New York City. When offered a position at Amherst College, she impulsively leaves the city. A tumbledown Victorian house proves an unlikely choice; nevertheless, it becomes the home that changes Joy forever. As the restoration begins to take shape, so does her outlook on life. 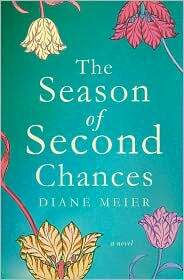 Amid the half-wanted attention of the campus’ single, middle-aged men and the legitimate dramas of her community, Joy learns that second chances are waiting to be discovered within us all. This book has a retail value of $25.00. In order to enter this giveaway, all you need to do is post a comment here – with your name and an e-mail address – or send an e-mail to Josephsreviews@gmail.com . This will count as a first entry. For a second entry, and speaking of second chances, tell us where you live now and where you would live if money was no object. Munchy the cat will serve as the contest administrator and will pick a winner. You must live in the continental United States to enter this contest, and if your name is selected by Munchy, you must supply a residential mailing address. The winner’s book will not be mailed to a P.O. box or to a business-related address. You have until midnight PST on Sunday, October 3, 2010 to submit your entry or entries. This is it for the contest rules. Good luck and good reading! 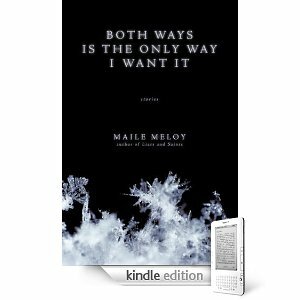 Both Ways… is a collection of eleven short stories written by Maile Meloy, the title taken from the one-sentence poem posted above. Meloy is a writer with a style that’s so cool its chilling; at times she will remind the reader of Joan Didion. And at least one of the stories here (“Liliana”) reads like something Didion might have written for The Twilight Zone. In Liliana, a man in Los Angeles hears a knock on his door and opens it to find his grandmother. Perhaps this does not sound so unusual, except for the fact that his grandmother died two months earlier. This compilation of stories is thus brilliantly structured, placed in a very deliberate order like the songs on a classic record album. As with a great recording, one is tempted to again listen to the songs (re-read the stories) to find the messages that were not obvious the first time through. Part of Meloy’s intelligence is displayed by the manner in which she disguises things. The first few tales are set in the remote state of Montana (far from L.A.) and the reader comes to think that maybe all of them will take place on that stage. They do not. Meloy also sets up situations that make you, the reader, think you know exactly what’s coming along before she fools you. In one story (“Red from Green”), for example, we see that an older man and a young woman both possess – and practice with – loaded guns before he considers making an uninvited move on her. Someone is going to get shot, right? Well, no, but you will need to read that story to find out what does occur. College literature professors are going to have a great time showing their students the hidden meanings and lessons buried in Meloy’s seemingly calm and quiet prose. But you don’t need to pay tuition to enjoy these tales of yearning, wisdom and acceptance. For the price of a trade paperback you can slide into a seat in Meloy’s classroom. Take good notes! 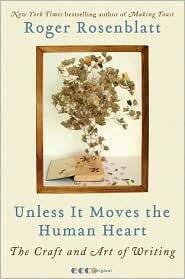 A review copy was provided by the publisher (Riverhead/Penguin).